Mijn accu is leeg gelopen terwijl de sleutel in de auto lag in mijn garage. Nu de accu paar weken later weer is opgeladen krijg ik op beide sleutels no fob detected..
Allebij de batterije’n vervangen vd sleutels maar nog steeds niets. Auto start wel wanneer ik de sleutel handmatig in het dashboardkast gleufje steek. Iemand oplossingen of ervaring hiermee? Je kunt extra FOB's bijleren maar ook weer opnieuw programmeren.Je zou het kunnen proberen maar geef GEEN garantie dat het bij jou werkt. Before starting, it is important to make sure that the glove box slot is working properly. If it is not, and the long procedure is started, then the car will be stripped of its fob programming, but will then not be able to accept new fob programming through the slot. This will leave the car unable to be started. Since most C6 owners have never tested the slot, or had to use it to start the car with a dead fob, they would be unaware if it had never been working properly since the car was new. To make sure that the glove box slot is working, follow steps 1-6 below. 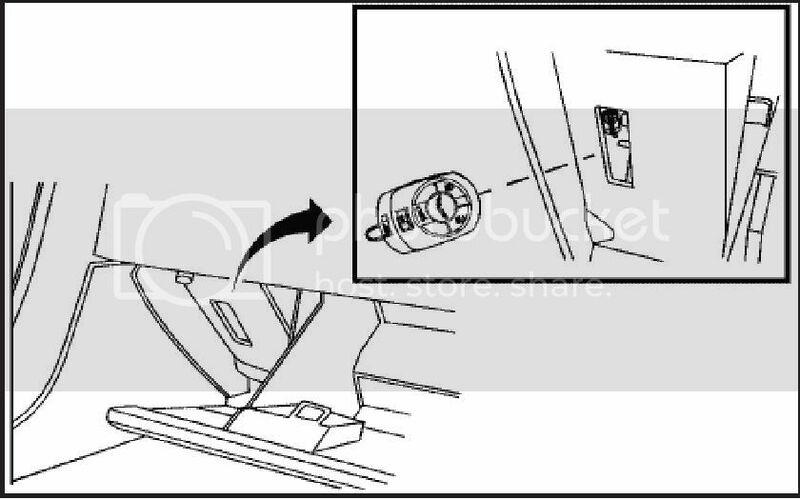 Then in step 7, you may either insert the new, un-programmed fob into the slot and continue to step 8, or you may insert one of the fobs that is currently programmed to the car into the slot. If the slot is presented with a fob that is ALREADY programmed to the car, the DIC will say “Known Fob”. This shows us that the slot is working correctly by recognizing this fob. Push the bottom half of the start button to end the session if you were just testing the slot for proper operation. Use these instructions (1-10) when you have a working fob and just want to add another to the system, or to test the operation of the glove box slot. 1. Put driver’s window down all the way, then turn car off. 4. Put working fob on console next to shifter (the one you are currently using to drive the car) IMPORTANT: Also make sure no cell phones are in the car. 5. Put key in trunk keyhole and turn the key five times in less than 5 seconds. 6. DIC will now beep and light up and say “Ready for fob 3”. 7. Put new un-programmed fob in slot by glove box with buttons facing right (passenger) side. 8. Wait and watch DIC. When it says “Ready for fob 4” it is done. Up to four fobs may be programmed to the car total. 9. When all Fobs are programmed, push OFF/ACC (bottom half of start button) to turn off DIC. 10. Test all four buttons on fob and then take away all other fobs and check car starting with new fob(s). Use these instructions (11-22) to erase car memory and reprogram all Fobs. Be sure to confirm proper operation of the glove box slot with the short procedure before using this one. Any lost Fobs that are not reprogrammed with this procedure will no longer work on the car. Lost Fobs that are later found may be added to the car with the short programming procedure. This procedure requires three consecutive ten minute waiting periods, so plan on spending about a half hour to do this, during which the car may not be moved. Remember that the number printed on the Fob only indicates the way it was first programmed at the factory. All Fobs are identical. The order in which they are placed in the glove box slot determines what number the Fob is. 11. Drivers window down, car off. 14. Make sure NO Fobs are anywhere near the car. (IMPORTANT). 15. Put key in trunk keyhole and turn the key five times in less than 5 seconds. If you decide at this point NOT to do the programming now, push the TOP half of the Start button and the car will return to normal. With step 17, all previous fobs will be erased. 17. Push the bottom half of the Start button. DIC will say to wait 10 minutes and will start counting down the minutes. You may close the trunk and car door while waiting for the ten minute countdowns. 18. After the first 10 minute countdown, DIC will again say “Off/Acc to learn”. Push bottom half of Start button again. DIC will again start counting down the ten minutes. 19. After the second 10 minute countdown, DIC will again say “Off/Acc to learn”. Push bottom half of Start button again. DIC will again start counting down the ten minutes. 20. After this third ten minute period is over, DIC will say “Ready for Fob #1” Regardless of the number on the Fob, the FIRST Fob that is put in the glove box slot will be recognized as Fob #1. Put the first Fob in the glove box slot with the buttons facing to the right (passenger) side. 21. After 3 or four seconds the DIC will beep and say “Ready for Fob #2”. Put the second Fob in the slot. The car will take a maximum of four fobs. When you have no more Fobs to program, push the bottom half of the “Start” button to end the programming session. 22. Test all buttons on the fobs to make sure they work, then take all fobs away from the car and, one by one, try using each to start the car. Na dit alles is er ook nog een youtube filmpje..misschien net ff iets makkelijker. C6 niet anders zijn,volg de instructies van Erik, dan zal het vast weer goed komen. Nu merk ik dat ik de sleutel van de kofferbak niet heb..
Er moet altijd 1 sleutel aanwezig zijn in 1 van de 2 key fob's van een C6.Deze sleutel heb je nodig als NIKS(accu) meer werkt en je kunt niet meer in je auto.Met deze sleutel kun je dan de achterklep openen zodat je de ontgrendeling die aan de zijkant onder het tapijt zit kunt gebruiken om je deur te openen.Om de key fob's te programmeren heb je deze sleutel ook ZEKER nodig omdat het 5x draaien van de sleutel in het achterklepslot de programmering in gang zet.Dus,geen sleutel geen programmering.Je zult een sleutel moeten laten maken en dat kan via je VIN nummer...in amerika moet je je VIN doorgeven en een "proof of ownership".Succes. Oke super bedankt voor deze info.. heb je misschien een site waar ik deze sleutel kan aanvragen?? Bel ff de gebruikelijke GM bedrijven op(Arton,Pietersen enz)en kijk of ze je kunnen helpen.In amerika is de ongeslepen sleutel een B-106 model..misschien dat het dan iets makkelijker is. Fob programmeren via de sleutel bij de achterklep werkt alleen bij US en Canada versies, de EU versies moeten met een Tech 2 o.i.d. aangeleerd worden. Probeer eens een Fob in het handschoenenkastjee in de daarvoor gemaakte opening te steken, kijk of je dan wel kan starten, lukt het dan wel dan is het echt de batterij van je Fob.